SPRAYER DESCRIPTION: This is our Electric 26 gallon Power Sprayer which is ideal for outside jobs like termite applications and landscape treatments. It features a Shurflo pump which runs on 12 volts and can pump up to 2.2 gallons per minute. It comes with a spray wand that can deliver both a fan and a pin stream spray. The hose is 15 feet long and fits perfectly around the top of the tank for easy storage and transport. The wand clips onto the tank for convenience when the hose is wrapped up. It comes with "quick connectors" (alligator type clips) for connecting it for power so you can run it by connecting to any deep cycle 12 volt battery. It can also be hard wired to an ATV, tractor, auto, etc for use in the field. The pump has a pressure sensor which turns the pump off when the system reaches a certain pressure. This feature saves electricity by preventing continuous running of the pump. 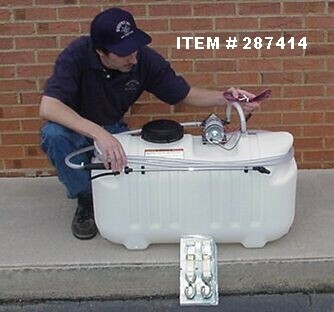 It comes with two mounting straps which are used to mount the tank for added security. TYPES OF MATERIAL IT CAN SPRAY: Limited to only liquids, the one drawback of this sprayer is that it will not pump wettable powders but it's great for Roundup, any emulsifiable insecticide, fertilizers, soil amendments, etc.